Why exhibit in Composite-Expo Exhibition? 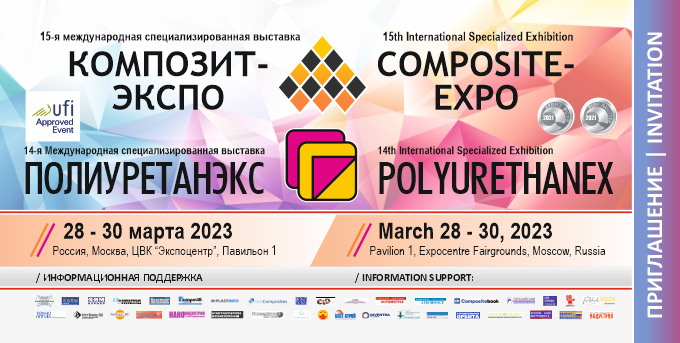 Information partners of Composite-Expo invariably are basic Russian and foreign editions and publishing houses such as Composite World Magazine, Plastiks: plastics processing industry Magazine, Composites 21 century Magazine, Composite Solutions Aero&Space Magazine, Composite Solutions Automotive Magazine, Chem-Courier Magazine, Polymer materials. Products, equipment, technology magazine; Polymers-money magazine, Territoriya Neftegas Magazine, Plastinfo Magazine, Eurasian Chemical Market Magazine, Russian Nanotechnologies Magazine, Science& Technologies of Russia Magazine; Construction Materials, the Equipment, Technologies of XXI Century Magazine; The Chemical Journal; Promyshlehyi Vestnik Magazine; ROADS. Innovations in Constructions Magazine, FRP Today (Fiber Reinforced Polymers), Chemical Equipment Magazine, Aviapanorama Magazine etc. Information partners regularly publish ads and final report materials about Composite-Expo. Active promotion via the Internet is carried out by means of promotional banners and press-releases on leading Russian and foreign industrial websites, regular e-mail postings to subscribers. We have been cooperating with information portals: Chemport.ru, HimTrade.RU, NefteGaz.ru, Plastinfo.ru, Materialsgate.de, Strf.ru, Best-stroy.ru, Rccgroup.ru, Stroyka.ru, PromPortal.su, Stroy-Obozrenie.ru, Oborud.info, Promrf.ru etc. One of the basic means of promotion is Direct-mailings on specially generated databases, and also ads at the Russian and partner foreign exhibitions, trade shows, conferences, etc. Partner of Composite-Expo are as follows: Composites Europe (Germany), China Composites Expo (China), the JEC Show Europe (France), Compotec (Italy), China Fiberglass Composite Materials Expo (China), International Advanced Materials Industry Exhibition (China), Composite China, Techtextil Russia, Annual International Conference & Blitz-Exhibition Composite Materials in Industry (Slavikom) (Ukraine), International Specialized Exhibition & Conference Komposity i Stekloplastiky (Ukraine), The China-Canada International Symposium on Green Composite Materials, Sampe China Conference & Exhibition, etc. If you like to improve your position at the market, join Composite-Expo!